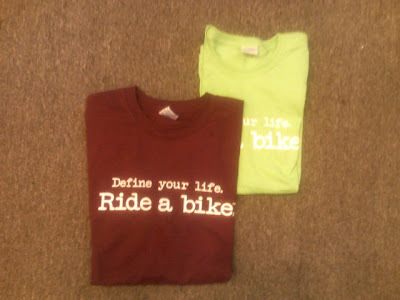 We just received a new batch of our popular "Define your life. Ride a bike." t-shirts. In addition to the current black and gray (men's), periwinkle (women's), pink (girl's), and blue (boy's), we now have men's in Maroon and women's in Lime Green! As always, a bargain at $9.99 each, or FREE with any new bike!